11 months after vehicle manufacturing first began at the Hofu Plant No. 1. If placed end-to-end, a line of 10-million cars would stretch approximately 16,000 miles - all the way from Mazda's headquarters in Hiroshima to London and back again. 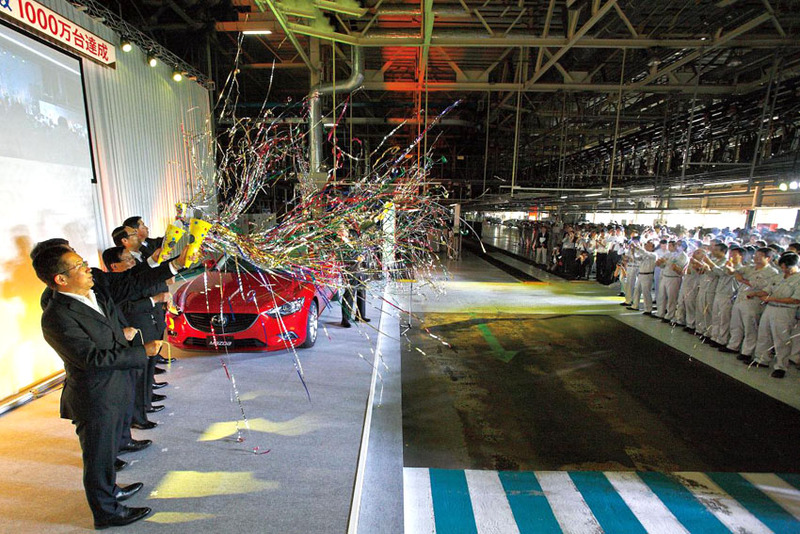 To mark this milestone in Mazda's history, a special ceremony was held at Hofu Plant No. 2, attended by Masamichi Kogai, Mazda's Representative Director, President and CEO, and Nariaki Uchida, Executive Officer and General Manager of Hofu Plant, to witness the 10-millionth vehicle coming off the assembly line. "The production of 10-million vehicles at Hofu Plant is a tremendous achievement, and we could not have done it without the support of our customers, our suppliers and other concerned parties, as well as that of the local community, the city of Hofu and Yamaguchi prefecture. On behalf of Mazda, allow me to express my deepest gratitude. We see this fantastic achievement not as a destination, but rather as a milestone on our road to further growth. Moving forward, we are committed to continue delivering fantastic products that delight our customers," said Masamichi Kogai. Full-scale production at Hofu Plant No. 1 started in September 1982. The Hofu Plant No. 2 began operating in February 1992 with a flexible-production capability for vehicle bodies and modular assembly systems on a mixed-model assembly line to best respond to changes in consumer demand.